Fell below flood stage Sunday afternoon. Current: 36.6' (Minor Flood Stage) Considered a 100-year flood. Forecast: Cresting overnight. Falling below Flood Stage by Tuesday. Impacts: Local marinas, boat docks, and low lying areas begin to flood. Impacts: Iowa Highway 10 floods over. Forecast: Falling below Flood Stage Tuesday morning. 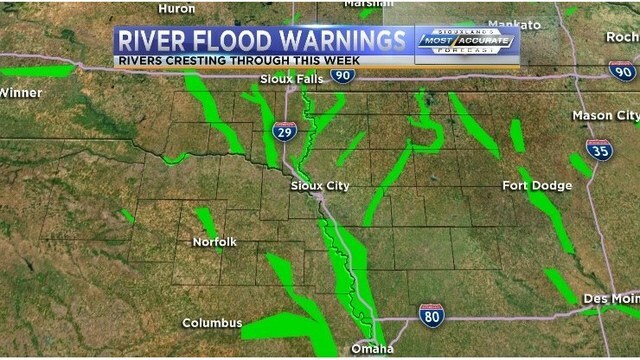 Impacts: Levees on the Iowa side in danger of being overtopped. Highway 50 near Westfield flooded and the bridge east of Jefferson, SD will be overtopped. Forecast: Falling below Flood Stage on Monday. Forecast: Falling a little. Steady within Moderate Flood Stage into the coming week. Impacts: Several roads in and near Cherokee will be closed due to flood waters. Forecast: Falling below Flood Stage Tuesday. Impacts: Homes & businesses along with Iowa Highway 31 South will flood out. Forecast: Falling below Flood Stage toward next weekend. Impacts: Significant flooding along the entire stretch of the river. The city park in Sioux Rapids floods out. Forecast: Falling below Flood Stage on Tuesday. Impacts: 170th Avenue south of Highway 9 is flooded near Horseshoe Bend county park. Significant amounts of pasture and farm land floods out. Forecast: Falling to Minor Flood Stage Monday. Fell below flood stage Sunday morning. Fell below flood stage Friday morning. Fell below flood stage Saturday morning. Forecast: Falling below flood stage Monday. Fell below flood stage Friday night. Impacts: Southern portions of the airport field are affected including approaches to the primary runway. Grass airstrips also inundated. Forecast: Steady - possibly rising due to melting snow to our north. Impacts: Mike Mickelson Park to the south of Iowa 9 is flooded out. Forecast: Fell below flood stage on Sunday. Access to the city of Hornick is still limited due to the destruction from flood waters. Fell below Flood Stage on Friday and the situation will continue to improve in Mapleton and Ida Grove. Fell below flood stage on Sunday. Impacts: Agricultural land and adjacent county roads are flooded out. Forecast: Falling slowly into Moderate Flood Stage by Thursday. Impacts: Significant agricultural flooding and Jim River Road also takes on water.